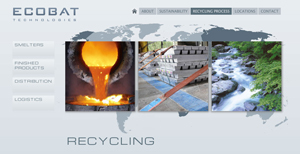 The Ecobat group in the UK has created a closed recycling process for scrap automotive batteries. Manbat, G&P Batteries and HJ Enthoven, all members of Ecobat, have joined together to maximise the materials recycled and reused from batteries. The process sees Manbat not only supply the new units but collect the scrap units from its customers, and sends the old units to sister company G&P to sort before transporting it on to HJ Enthoven for the recycling process. The old lead from the batteries are then melted down into either pure lead or lead alloys, and the lead ingots created from the process will be sold to battery manufacturers to use in the production of new products, before the process restarts when Manbat distributes new products to its customers. The Ecobat recycling process will see approximately 99.97 percent of the lead recycled, and it convert other substances that would be considered waste into products that are ready to reuse or sell on, including sulphuric acid, polypropylene, zinc, aluminum and industrial minerals.